Postural and balance strengthening is the key to maintaining a strong, resilient body. And it starts with your feet. At The Foot Clinic, we have established that posture and strength influence one another: postural weakness may cause pain and loss of strength. And if you have pain or any other dysfunction, you will also have a poor posture. As part of your general foot care, it is important to build in postural and balance strengthening. Your podiatrists at The Foot Clinic will be happy to work out a personalised care plan. When your feet touch the ground, the way this happens defines the quality of your movement. Any abnormality in the position of your feet when you walk, run or simply stand, will impact your whole lower body. From the feet and ankles up through the knees and hips, all the way through to your lower back. So if you have a problem like flat feet, or have been wearing inappropriate shoes for years, you may actually be prone to postural and balance weaknesses and pain. At The Foot Clinic, we believe in building better bodies, from the feet up. Understanding foot positioning is a first step. Getting clear on the bio-mechanics of your body helps make the right improvements. It will avoid further problems (and more podiatry treatments) down the track, and it will improve your performance, whether you’re an athlete, doing office work, or a young child. When you have postural problems or posture weakness is can impact the way your move, use your feet and can cause discomfort over an extended period of time. Using the PowerPlate is one of the first steps in postural and balance strengthening. Using this tool, your balance mechanism becomes more developed. Over recent years, science has helped us understand the connections between the deep muscles that stabilise your feet and your core (myofascial connections). Strengthening these connections is the foundation for postural and balance strengthening. If all goes well, our feet act like springs: they provide strength and elasticity. This doesn’t happen all by itself, and there are a large number of bones, tendons, ligaments involved to make this happen. So what we’re after is the optimum amount of strength and elasticity, so your feet can handle the loads you may expose them to. Your program begins with FMT (Foot Mobilisation Therapy) to reset the position of your bones. It is followed by PowerPlate Proprioceptive Stimulation Therapy or PPST, to supercharge your balance mechanism. And we also introduce Foot To Core Integration (FTCI) strengthening. This is a set of single-leg-stance exercises, to create more postural strength and stability. FTCI strengthening activates the balance nerves in your feet, and the strong stabilising muscles. It also activates the deep core muscles of your pelvis. And, it connects the two core areas. You will find that elite performers such as gymnasts and acrobats in Cirque du Soleil are given exactly the same exercises, to get totally stable and balanced and to avoid injury. Anatomy Trains Structural Integration (ATSI) is another hands-on technique we use, to adjust the myofascial structure of your body. It improves your postural alignment, balance and flexibility. Our podiatrists use this technique for many foot and lower limb conditions, and as a result it can also be excellent at helping with many other postural symptoms like back pain, neck and shoulder pain. We also work closely with dedicated ATSI Practitioners so they may take you further with your myofascial adjustments. Our podiatrists also use Physitrack, a powerful app full of exercise videos. It gives you a set of personalised postural and balance strengthening exercises, and it allows you to keep track of your results and share them with your podiatrist at The Foot Clinic. Whatever your situation, we will always start with a clear diagnosis. 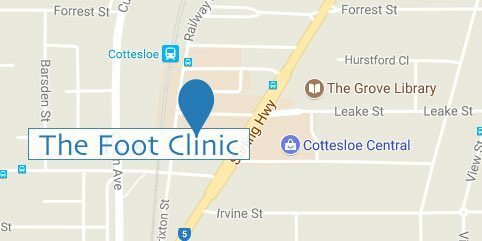 From there, we will recommend a treatment plan and provide options from our wide range of podiatry treatments at The Foot Clinic. Our team of friendly and experienced practitioners thrives on a simple mission: to build better bodies, from the feet up. We look forward to helping you get a healthy posture and an exceptional balance!